My Favorites from "Top 10 Reasons to Support the Arts"
10. True prosperity…The arts are fundamental to our humanity. They ennoble and inspire us—fostering creativity, goodness, and beauty. They help us express our values, build bridges between cultures, and bring us together regardless of ethnicity, religion, or age. When times are tough, the arts are salve for the ache. I remember when the Twin Towers were destroyed, along with the lives of thousands of people. My Celtic music band was scheduled to play an outdoor community concert a few days later. There was a lot of talk back and forth about whether we should perform as planned or not. The local arts council in this community decided we should go ahead with our plans. In our hotel room the tv was filled with horrific images and never-ending talk about what had happened and why. In the lovely South Carolina downtown city park space we saw in front of us people of all ages, multi-generational family groups, the largest crowd we'd ever had at an event like this. We had never quite experienced the kind of focus and energy we received that night. There was a palpable connectedness between everyone present. We didn't talk much about recent events and we didn't change our show in any major way. We just showed up, showed our humanity, and filled a need in that moment. It's an experience I will never forget. I hear a lot about the need for schools to produce (?) 'creative, out-of-the-box' thinkers in the name of business. Yes, and for many other things as well. We need good problem solvers in all areas of life. I'm not sure, however, if a college arts degree is all you need to succeed in life or that (as I read it) the arts are the only way to learn to be creative. The arts are a creative pursuit, to be sure, but there are many other ways of thinking creatively. It is possible to transfer a creative, problem solving mindset between subject areas, but an arts degree is not the only way. Myself, I got a BA from The Evergreen State College in Olympia, WA in the social sciences. TESC is an interdisciplinary state university where the focus is on thematically and question based inquiry; essentially, learning how to make connections between ideas and information, and to ask questions, find the answers, and then ask more questions, no matter what subject you're interested in. 6. Improved academic performance…longitudinal data of 25,000 students demonstrate that students with an education rich in the arts have higher GPAs and standardized test scores, lower drop-out rates, and even better attitudes about community service. These benefits are reaped by students regardless of socio-economic status. Children motivated by the arts develop attention skills and strategies for memory retrieval that also apply to other academic subject areas such as math and science. Children motivated by the arts develop attention skills and strategies for memory retrieval that also apply to other academic subject areas such as math and science. 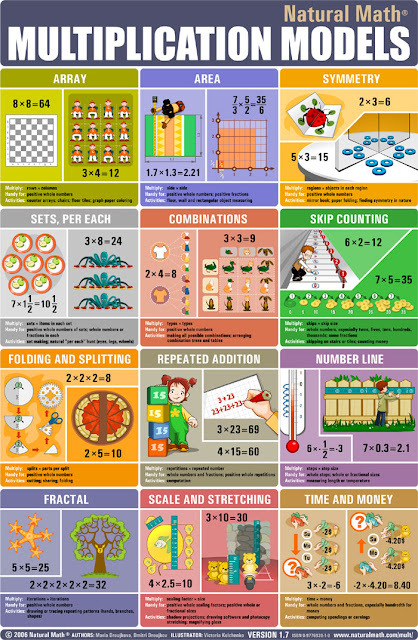 I've written elsewhere in this blog about how I am remediating myself by learning math along with my currently five year old daughter. I am a classic case of someone who probably would have LOVED math but instead got confused by a worksheet in kindergarten (something about bumblebees) and never fully recovered. In high school I loved geometry so much that I was motivated to memorize all the theroms. I was never able to apply what I learned, but I think it was the challenge and process of understanding interesting rules that caught my attention. Plus, geometry is visual, which is my thing too. I really had to address my math phobia when I came up with the bright idea to integrate math with percussive dance, but what I realize now is that my love of geometry (which some people, I've heard, call the only 'real' math, but that's another argument conversation) has really served me in that effort. And, the effort I've put in over many years to make sure I really understand the math the fits with percussive dance has also restored some of that natural mathematical curiousity which I lost back in kindergarten in the '70's. I am really starting to see how math can be playful and full of interesting ideas and questions and it's own form of inquiry unto itself, just like being playful in the process of creating percussive patterns. It's okay to ask questions that have more than one answer. Not only that, it's FUN! "I'll write 100 really BIG because it's a BIG number and 1000 even BIGGER. And then a quadrillion." "One hundred pennies in the form of a dollar bill." My daughter has also had some questions about if the numbers ever end. I think she was happy when we read a book called The Cat in Numberland which was about the Hotel Infinity where numbers keep moving in and there are always enough rooms for them, and it seemed to provide the answer she was looking for. She still tells me she loves me 'to the end of the numbers' which is very sweet, even if it's not accurate! In her kindergarten class she's been learning basic addition and subtraction. She comes home and writes down little equations. This morning she said, "Tell Matilda [her toy cat] what subtraction is." I said, "What can you tell her?" She answered, "When you take away a number to make a smaller one." "Three minus eight equals....zero! And I'll put a minus sign on the zero because it's less than zero." "I think I'll go out and get you a number line!" Even though I don't do anything with multiplication in my program, I still thought this multiplication models poster from Natural Math was too good (not to mention too beautiful) to not share! A student's illustration of his Jump Pattern A, at his own volition, no prompting. Start in center. Feet together. Assume all four beats move on a Jump. The first two beats work just fine as written. ﻿In Beat 3 you are still facing forward, right and left foot are not labled, but the arrows give you a clue. How far do you turn on Beat 4? Can you do this pattern backwards (a reflection of the beat order, e.g. 4, 3, 2, 1)? How else can you rearrange these four beats to make a different pattern? Did it work? Which combination of beats/moves did you like the best? "Is doing research in mathematics a creative process? When mathematicians talk of their subject as beautiful, what do they mean? What are their motivations? Their dreams? Their disappointments? These themes are explored in the collection of five short films produced as part of Mathematical Ethnographies project. The focus is not on mathematics, but on the people who create and teach mathematics - on mathematicians." "Like writing a sonnet, you have to conform to precise rules but having that structure there to constrain you somehow enhances the creativity." "To be good at mathematics you have to develop a new insight." "There are moments where things become clear, it comes out of nowhere. I'll be in the shower, cycling, and somehow the answer comes." "It's hard to see how asking a question no one has ever thought of before is a logical process." "I always think it's nearer to architecture rather than to other arts; one is trying to build this formal structure up and there are supports and girders and there are connections..."
Are Mathematicians creative? If creativity is a process more than a product, I think then that the answer is yes. What do you think? Maria: Great article, Malke - thanks for sharing! I loved the photos, and especially the cool graphic organizers and visuals you use. Do kids like to use the charts? Does it depend on the person? Malke: What plays out again and again in this program is that teachers are really surprised when they see how enthusiastic their students are when it comes to writing about their experiences in Math in Your Feet. Recording their patterns using the one best word to describe each category of each beat *is* challenging, but they are motivated toward accuracy because it is *their* pattern. 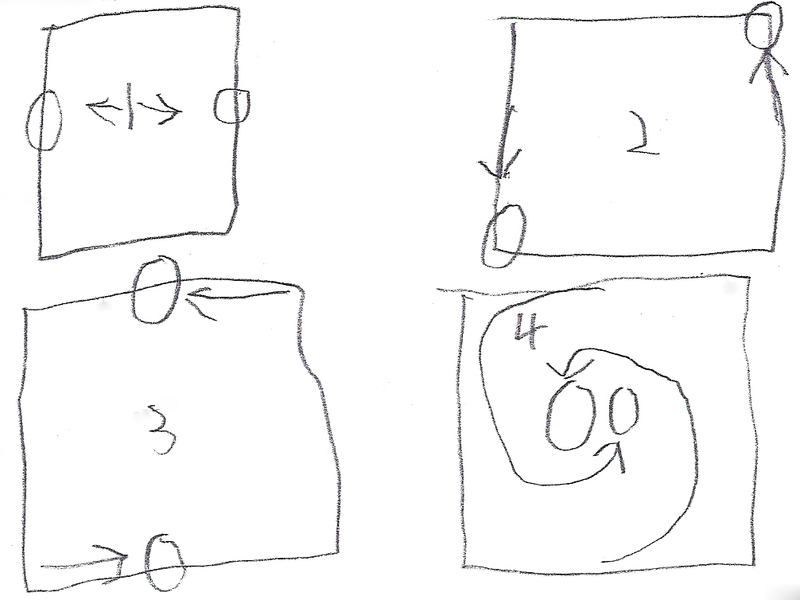 Also, it usually plays out that within each team of two, one person is more comfortable in the 2D realm of the page than the other, and one is more comfortable moving than the other -- it's a team effort, which makes it more comfortable for everyone. Once the kids do the tough work to record their pattern using the descriptive words, it's actually quite easy for them to plot their feet on the simple grid. 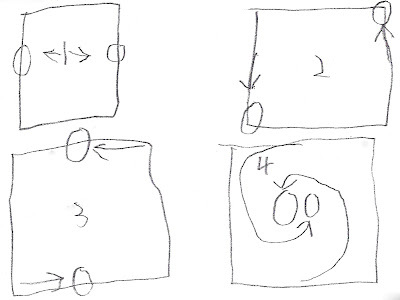 I still think there is a better, maybe more mathematically accurate way to do this, I just don't know what it is yet! There are, however, whole groups of kids who still just need the physical portion of the program (more and more, sadly). These are kids who never had a chance to develop spatial reasoning in preschool, for instance. They don't have enough math, even in 4th or 5th grade, to use the program to take them further -- I find that they begin to understand the math concepts as if it's the *first* time they've ever seen or heard about them. In these cases, I require just the minimum in their workbooks, and I purposefully stay in the physical realm. It may be the only time they will ever have to just 'play' with math. Maria: Mathematics is "embodied" in that its grounding, basic metaphors come from bodily experiences and observations. You can't skip over that and go into formal math. Even working with adults, I find that you need to go through folding, building, mirroring, measuring and other physical activities and/or stories if math does not make sense to them. Malke: This is great to hear, and I believe it wholeheartedly based on what I see kids do in my program and in my personal math (re)learning...I just gave a very well attended 90 minute hands-on presentation at the NCTM [National Council of Teachers of Mathematics] annual meeting and it was surprising how many of these adults were really quite challenged. It has nothing to do with being 'good' at dancing and everything to do with not having enough experience working with and within a physical realm. I attended a session on the van Hiele Levels [for developing geometric thought] and realized that this probably applies to adults as well -- experience is key to understanding. What is interesting to me is that my 'hunch' eight years ago, that there might be math in what I did as a percussive dancer, is now more true than I initially imagined. At that point in my life I believed, as most of us probably do, that math is primarily symbolic. I realize now that the math I bring to children in the form of rhythm and dance is some of the experiential math they may not have ever had, and that they need this kind of experience to move forward. I've heard that only 10% of us will understand the symbolic realm of mathematics without needing to first have, as Maria says, "...bodily experiences and observations". Just this fact alone makes DOING hands-on, experiential math that much more of an imperative. Here's the link to our full conversation on the Natural Math forum. Jump Patterns: The Full Story! I'm am thrilled to announce that my article, Jump Patterns: Percussive Dance and the Path to Math, has just been published in the Teaching Artist Journal, the only peer reviewed publication for my (still very new) profession. 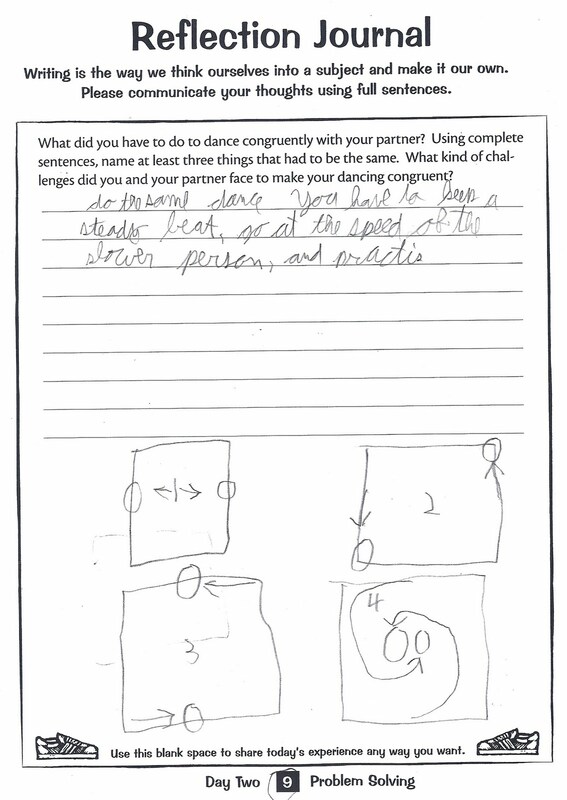 The article focuses on how my approach to teaching percussive dance led me to search for, and find, relevant math connections. I outline how I developed and formalized 'Jump Patterns,' a teaching tool which illustrates the elements of percussive dance (similar to how creative movement teaches the elements of other formal dance styles like ballet or modern dance). I also describe how this tool has helped children become creative in my art form and make many meaningful connections to math topics at the same time. Although I have shared much about my work in this blog over the last five months, the newly-published article is the first time I have provided a comprehensive, detailed description of Jump Patterns and how they are used in the classroom. The article can be found here. I am very interested to hear your thoughts, observations, and questions about my approach as well as any similarities to other approaches out there. I've just finished a five-day residency up in Indianapolis as the second part of Young Audiences' Signature Core Service pilot. Most of the time it seems the dance and rhythm aspect of this program brings kids closer to the page by motivating them to write, sometimes for the very first time, multiple meaningful sentences about their experiences creating original dance steps. The program can also help kids think of math as a friend, not a foe, also for the very first time. ....upon reflection, I realize now they might have been bored. They might have been bored because they really knew their math, but at the same time they couldn't really do more than fourth graders normally can do with their bodies. I think that if I had had more time with them, or could do it over, I would have found a way to get their brains more engaged while their bodies worked at age-level. I would have challenged them to really play with their patterns. For example, instead of just making a Pattern A and B and combining them into a third, 8-beat pattern (which is a great amount of play in itself), I would ask them how many different ways they could recombine the four beats that made up each pattern, and then encourage them to ask more questions along that line of inquiry: What if we reflected the pattern to itself, beats 1, 2, 3, 4, 4, 3, 2, 1? What if we took our two favorite beats from the two patterns and traded them with someone else? "What if...?" is one of my favorite questions, after all, because you never know where it will take you. Day One: "You have a friend who was absent today and missed the first day of Math in Your Feet. Tell that person about all the different ways you made patterns with your feet." First, we had vocab words, such as hop, slide, clog, etc. then, we made and [sic] pizza, and used all of the dances. For example, we did sausage as slide. As it says, Math in Your Feet! Today Ms. Malke came in and we learned all about dance steps. This is called clogging. Clogging and step-dancing are actually cousins! When we were dancing sometimes we put our feet to a 90°angle and other times she told us to turn our feet to an acute angle. We also used a lot of math vocabulary words. We all had a great day full of dancing and math. Today for an hour we did math in your feet. We did clogging, and the chug. We made a pizza in our mind and did different dances to represent what we put on the pizza. We made patterns by dancing. When we danced we also made rhythims [sic]. We also pretended to make pizza. Day Two: "What did you have to do to dance congruently with your partner? Using complete sentences, name at least three things that had to be the same. 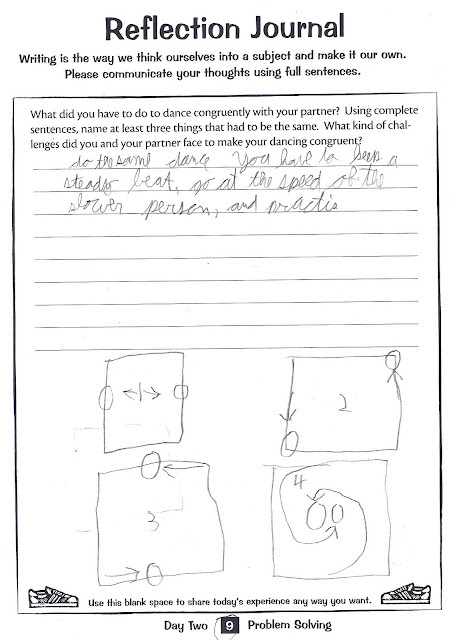 What kind of challenges did you and your partner face to make your dancing congruent?" To dance congruently with my partner we had to count out the four beats. The timing, dance steps, and the beats all had to be the same. One challenge we had was timing at first, but then we practiced and practiced and we finally got it at the same time. My partner and I had to take one step with our right ft. 1st, then left, turn 180° right, then 180° left. The kind of challenges we had to face are having to make sure we both knew what order our steps were in then we counted 1, 2, 3 to know when to start. Do the same dance you have to keep a steady beat, go at the speed of the slower person, and practice. My partner and myself really didn't have any problems, but if I had to pick three I would pick that 1. was that I could not get the steps right. 2. We could not stay together. 3. We could not figur [sic] out how we wanted to do are [sic] steps like for example speed fast, mideam [sic] or slow. Me and my partner faced lots of challenges. We did a 270° turn wich [sic] was hard to be congruent while doing. The speed, movement, and moves had to be congruent. To dance congruently, I had to say something to signal us to start dancing. The 2 diagonal splits & 1 side split had to be the same so it would look good. Day Three: "Write a friendly letter to your partner. First, tell this person about what you had to do to reflect your dance pattern across the line of reflection. Then, tell your partner what your favorite MIYF dance move is and why!" I had to turn right instead of left to mirror your moves. I love our Pattern A! It's casual, but interesting. I can't wait to see Pattern B. To reflect our dance pattern across the line of reflection you had to do it in the opposite sides and I did it originaly [sic]. My favorite MIYF move is a slide, with our feet together, and back just because it's fun to do! In Math in Your Feet we did a line of reflection and how we did it was we had to pick a person to be the original and the reflector. The reflector had to do oppsite [sic] lefts and rights. My favorite dance move was the cross because it is fun and it makes me feel like a real dancer! I had to instead of going right diagonal at first I had to go left to right Diagonal. I don't have a favorite dance move because I don't like to dance. I love having you as a partner because you don't get mad when I mess up and you agree with anything we do. I could go on with the tanes [tons] of things good about you but I'll stop there. First, we had to pretend we were looking in a mirror. We had to switch our rights with lefts and lefts with rights. My favorite dance step is turn because I like getting dizzy. I wrote recently about a phrase that popped into my head one morning. I was thinking about how to explain my five year old on her best days. The words that popped up into my head were "fearlessly creative." And then I thought, what does that mean? Well, the most important thing that it means is that when you are fearlessly creative you DO no matter what. The doing doesn't have to be Art with a capital A, but a lot of times it has to do with making something. So, you just DO. Even if doesn't turn out exactly the way you planned. Even if it's not perfect (whatever that is). Even if it amounts to nothing. Even if it just leads you to the next question or the next idea. Practice makes permanent. Kids practice and practice and practice. It's part of the process. And then, lo! They remember and they understand! Nothing ventured nothing gained. You just gotta get going. Move your feet. Even though getting started is sometimes the hardest bit. The journey of a thousand miles begins with one step. Literally. All work and no play makes Jack a dull boy. Kids play with math for possibly the first time in their lives. If at first you don't succeed, try, try again. Trying is like practice, you just do it and see how much further you can get with each try. If it's not working, then try something else! Genius is 1% inspiration and 99% perspiration. Yes, we perspire in Math in Your Feet. I would expect nothing less! Failure is always an option. You know, I don't really require the kids to be good dancers, or even good at math. I just require they be present and put in the effort. Plus, in my experience, I've learned more from failure than from doing something exactly right. I'm thinking I might make these aphorisms part of the residency reflection and wrap up. Wouldn't that be cool? "Okay kids, have you ever heard the saying 'If at first you don't succeed, try, try again'? Yes? Well, give me one example of how it relates to your experience in Math in Your Feet this week." We'll create a whole new assessment trend: Aphoristic Assessment. It's at least worth a try. I'll let you know how it goes! Keesha says my fish doesn't look like anything she's ever seen. "Flowered fins? Plaid scales? And the tail -- tie-dyed weirdo green?" In this ocean, I am Queen. That tail, my dear, is aquamarine.